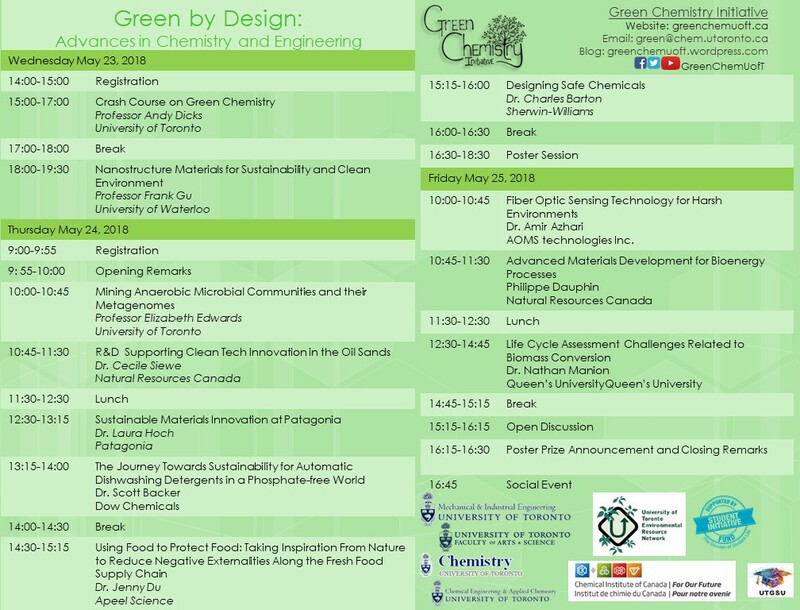 The 'Green by Design: Advances in Chemistry and Engineering' symposium is our 6th annual symposium and is designed to connect students, post-doctoral fellows and faculty members interested in Green Chemistry & Engineering with current leaders in the field to discuss advances in chemical processes and industrial technology. The symposium is a two and a half day event which will take place on May 23rd - 25th, 2018. All symposium events will take place on or near the University of Toronto - St. George Campus. The electronic symposium program booklet is now available! Click here to learn more about the program, and here for the full poster abstracts. An optional crash course on the fundamentals of Green Chemistry? Seminar talks on innovations in oils sands, agricultural, apparel, bio energy technologies, and more! After registering, all participants must fill out a questionnaire to let us know if you are presenting a poster. Please click here to access the questionnaire, and fill it out by May 15th, 2018. We encourage all of our attendees to submit an poster abstract for our poster and networking session on Thursday (May 24th) afternoon. Abstracts should be limited to 200 words. Please note that posters do not need to already include green chemistry for consideration. However, all presenters are invited to look for opportunities to talk about green chemistry within the context of their research. Posters from previous conferences are welcome. We are offering a total of four travel scholarships to contribute towards travel and accommodation expenses. The value of each scholarship is a maximum of $250 CAD. Applications are due Monday, April 20th, 2018 at 11:59 pm by email at สล็อต999gcisymposium2018@gmail.com. For full details and access to the application, please click here (PDF). The cost of the symposium is $60 CAD for non U of T early bird registration (by April 15th, 2018) and $40 for U of T early bird registrations (by April 15th, 2018). Regular registration cost is $ 100 CAD for non U of T registration and $ 80 CAD for U of T registration (by May 15th, 2018). The registration fee includes all symposium events, as well as lunch, refreshments and coffee that will be provided as part of the symposium program on the full-schedule days (May 24th & 25th, 2018). Registration does not include accommodation and travel fees. Registration opens March 15th, 2018. The Department of Chemistry and the Department of Mechanical & Industrial Engineering have graciously offered to cover the registration fee for graduate students and post-docs working in those department. Registration will be available during Friday Donuts at 4 pm in the atrium from April 20th until May 11th (no registration on April 27th due to ChemClub Formal). Alternatively, feel free to approach Yuchan Dong or e-mail the Symposium organizers directly at gcisymposium2018@gmail.com on your own time to register. Registration for MIE will be available at Friday coffee at 1 pm in MC330 from April 27th until May 11th. Limited registration costs will be covered for members of The Department of Chemical Engineering. Please register for the symposium as a U of T member, and send an email to Jennifer Hsu (jennifer.hsu@utoronto.ca) along with a paragraph about why you want to attend the symposium. Successful applicants (6) will be refunded their registration fee. In order to secure your spot, a $20 cash deposit is required at the time of registration. This deposit will be returned in full upon completion of the symposium. The internal registration deadline is May 18th, 2018. The nearest accommodations can be found at New College residences at the University of Toronto St. George campus. The symposium begins at 3 pm on Wednesday, May 23rd and ends at 6:30 pm on Friday, May 25th, although you are welcome to stay a few days over the weekend to explore the city of Toronto. Student rates at New College are $47/night for a single room and $64/night for a double room plus tax for up to 5 nights. You will be required to book accommodation on your own, but we are happy to assist or provide more information. Remember to book well ahead of time to ensure your spot! Book a room at New College here. Email us at gcisymposium2018@gmail.com with any questions. Toronto has an efficient subway and street car system. Tickets are $3.25 for each trip, visit Toronto Transit Commission (TTC) for more information. To arrive at the University of Toronto St. George campus from Pearson International Airport (YYZ), take the 192 Airport Rocket to Kipling subway station (the last station), then take the Bloor-Danforth subway eastward to St. George subway station. The UP Express can also be taken from Pearson International Airport to Bloor Station (at Bloor St. W and Dundas St. W) or Union Station (Front St. and University Ave.). A short ride on the TTC will bring you to University of Toronto St. George campus. Head eastbound from Bloor UP Express Station to St. George subway station (Bloor-Danforth, line 2) or northbound from Union UP Express Station to St. George subway station (Yonge-University, line 1) arrive at the campus. If you are flying Porter Airlines and decide to take public transit from the Toronto Island Airport (YTZ), take the Porter shuttle which will drop you off at to the north-east corner of Front Street and York Street, and then cross to the south side of Front Street and enter Union subway station. From there, take the Yonge-University, line 1 subway northbound to St. George subway station. For more information on how to get to the University of Toronto St. George campus, visit Directions to UofT. Please do not hesitate to contact us at gcisymposium2018@gmail.com if you have any questions. Make sure to check back or follow us on สล็อต999 and Twitter for more updates!